Flickr/Liviu Florin Albei. Some rights reserved. According to official results announced Monday morning, Iohannis managed to get 54 percent of votes while his main opponent, current prime minister and Social-Democratic leader Victor Ponta, got 45 percent. The counting of votes is still to be finalised, but Iohannis is expected to be confirmed as president on Tuesday. Ponta already conceded defeat Sunday night, saying that “the nation is always right”. Iohannis’ victory was somewhat unexpected. In the first round of elections on 3 November, he had gotten around 30 percent of votes while Ponta scored 40 percent. Yet in the two weeks between the two rounds, Ponta’s opponents mobilised in an exemplary way both on the streets and on social media, leading to an increase in turnout from 50 percent to over 60 percent and in the reversal of scores. In Romania, Ponta and his Social-Democratic party are seen by many as the epitome of corruption and inefficiency. Ponta has been a prime minister since 2012, a period in which his party peers supported legislation that would give immunity to corrupted politicians, criminalise investigative journalism, or give extraordinary powers to corporations in the extractive sector. The government also enforced a “special security zone” at Pungesti in eastern Romania where Chevron was doing exploratory work for shale gas allowing police to crush anti-Chevron protesters. Ponta is also notorious for his lack of reliability: while in opposition, he criticised austerity only to implement IMF-dictated austerity measures once in power; before taking office, he opposed the Rosia Montana gold mining project that brought tens of thousands to the streets in 2013, only to get behind it as soon as he became a prime minister. Yet the strong passions around these elections were not caused only by Ponta and the Socialists’ faults. There are two more factors to be taken into account. For one, at the end of ten years with centre-right strongman Traian Basescu as head of state, the center-right electorate in Romania could look to new candidates and renew their hopes. The most promising of them was Klaus Iohannis, a Romanian of German ethnic origin credited with having done a stellar job as mayor of the city of Sibiu and representing an alliance made up of Romania’s two main centre-right parties. Most importantly, Romanian society had changed in an important way during 2013. Last year, some of the strongest protests in Romania’s post-socialist history rocked the country and led to the indefinite postponement of a project to build a gold mine at Rosia Montana in Apuseni Mountains. During those demonstrations, many felt for the first time that they can and should make a difference to political life in their country. For some, the presidential elections this year constituted a major opportunity to see an electoral expression to the street movement. On top of this, Ponta’s government made a serious mistake. During the first round of elections on 3 November, thousands of Romanians living abroad in Western Europe did not manage to vote despite sitting for hours in line in front of embassies, because of administrative problems. Because Romanians in Western Europe voted overwhelmingly for Iohannis, many thought their exclusion was a tactical move by Ponta’s government. Solidarity protests ensued in various Romanian cities, particularly in western Cluj, where more than ten thousands took to the streets one week after the first round. Ponta’s government, however, did little to ensure the exclusion of Romanians abroad would not repeat in the second round. While more Romanians did get to vote in the second round (close to 400,000 compared to the first round’s approximately 200,000), images of people sitting in kilometre-long lines in front of embassies still circulated all over Romanian traditional and social media, stimulating those at home to get out and vote against Ponta. Spirits have been very high in Romania over the past weeks. Ponta’s opponents, many of them important journalists and commentators who have the power to shape public discourse, depicted these elections as a fight of democrats vs. Ponta’s "communists", of good vs. evil, of a European future for Romania vs. getting stuck in the past. This gloom and doom rhethoric was very much embraced by people active on social media and taking to the streets in various citites between the two rounds of elections. People felt the stakes of these elections were very high and that those supporting Ponta (traditionally thought to be the poor and less educated from rural areas or smaller towns) were dragging the country behind out of ignorance or out of short-sighted personal interest, because they accepted the Socialists’ electoral bribes. Sunday’s results brought tens of thousands to the streets again across Romania. Among them, there are both people who voted for Iohannis as "the lesser evil" and those who are conviced that Iohannis is the way forward for Romania. 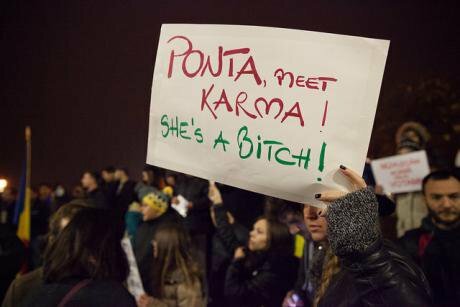 While some of the protesters would have wanted them to stay focused on an anti-Ponta message, in most places people ended up chanting pro-Iohannis slogans. In Bucharest University square, Iohannis joined the crowds on Sunday night. Excitement is high in Romania. But whether these elections are as miraculous as many Romanians taking to the streets these days think is doubtful. For one, the president in Romania does not hold enormous executive power. The head of state can veto legislation approved by the parliament, is a guarantor of the Constitution, deals with foreign policy and can make some judicial and security services appointments. Iohannis will become a president, but Ponta will remain a prime minister (despite calls for him to resign heard on the streets Sunday night) and for now the parliament is still dominated by Socialists. While Iohannis is seen as diametrally opposed to Ponta, the two were political allies in 2009 and 2012. The Social-Democrats may be corrupted, but neither do Iohannis’ Liberals have a spotless record. Importantly, Romania has lived such "revolutionary" electoral moments before, when Traian Basescu was elected president in 2004 and when the first post-socialist centre-right candidate, Emil Constantinescu, became president in 1996. Yet the country has done little more than muddle through the post-socialist transition. Iohannis’ political programme is a straightforward liberal proposition, putting forward the need to make the economy more liberalised and competitive, to support the business sector, maintain a flat tax, stick to European fiscal discipline. It proposes a strengthening of alliances with the EU, the US, and NATO. Iohannis may be credible when he proposes these things, but his proposals are nothing new to Romania. Nor is a simple pro-liberalisation line necessarily the most suitable for a country where 40 percent of the population is on the brink of poverty. Just like other election rounds in Romania, this ballot too has hardly sparked any original thought on what the Romanian society really needs and whether this is all covered by the EU recipe. Most of the campaign has been fought in symbolisms. What was positive in these elections was the strong mobilisation by people and the sense they had that they want to be involved in politics. Not having Ponta as a president is nothing to feel sorry for. What is more problematic is that Iohannis represents a vision of politics that speaks only to those who are managing fine during the transition. Protesters, though many, were mostly representing this part of the population. What is important right now is that Romanians continue to stay alert and keep an eye on power. And also that those who support Iohannis - and Iohannis himself - find ways to connect to the other part of Romania, the one that was not in the streets or on the internet, and who may have voted for Ponta out of fear of what the future may bring.